I actually wasn’t sore after running MCRRC race on Saturday; but walking around in the Mall with folks done some damage to my legs. Knees were sore on Sunday, but felt somewhat better on Monday morning. During lunch hour of April 23, I ran out to Tidal Basin for an easy 33m’45s’, approx. 4.8 miles. Then next day morning, there has a slight chill in air. After several years living in Maryland, I must admit I love running in the cold. I got to L Street locker early for a five mile run in the RCP trail. Air was clear and breeze at sub-40s degree, I suppose spring getting to the end, meaning I am getting a big break from pollen. I stroll around for 36m’38s’ approx. 5.1 miles; I felt afterward. However, I unaware of any injury or bump, I felt an intense tight-soreness on my left knee before bed last night. The soreness didn’t gone away as I woke up this morning. I understand I just ran a fracking marathon; it is definitely good idea to take it easy. While I was planning ahead for fall marathon and noticed North Carolina Marathon is cancel for 2012. 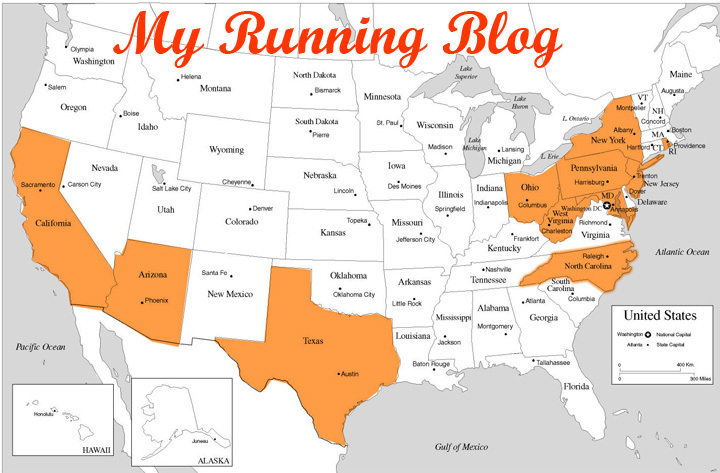 I am thinking running either Outer Banks Marathon on November 11 or one of North Face Endurance Challenge Marathon in Kansas City, MO or White River Marathon for Kenya in Cotter, AK on November 17. You may consider not racing much after a marathon...especially these shorter races. AK sounds cool & cold!! haha. I have a friend working there. :) MO and NC are good too.